I have been looking at this dresser mirror salvage piece at Jackson's Icebox Antiques & Collectibles for a couple of years now. I knew the piece was large, and the only place it would work was on my mantel. But I turned 60 last week, and I guess I thought, what am I waiting for if I like it? And I took the plunge and purchased it. 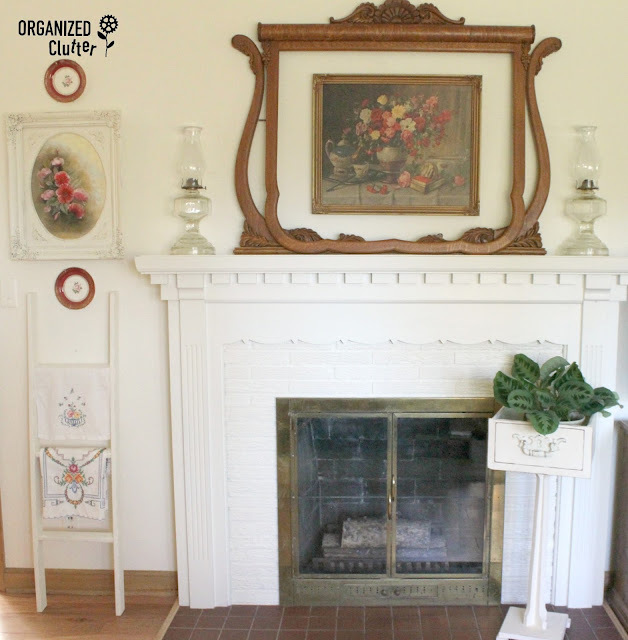 My last mantel was plates, old frames and my favorite old print in the center. Another oil painting by the fireplace, painted by a local artist, was a favorite but I just never liked the brassiness of the gold frame. 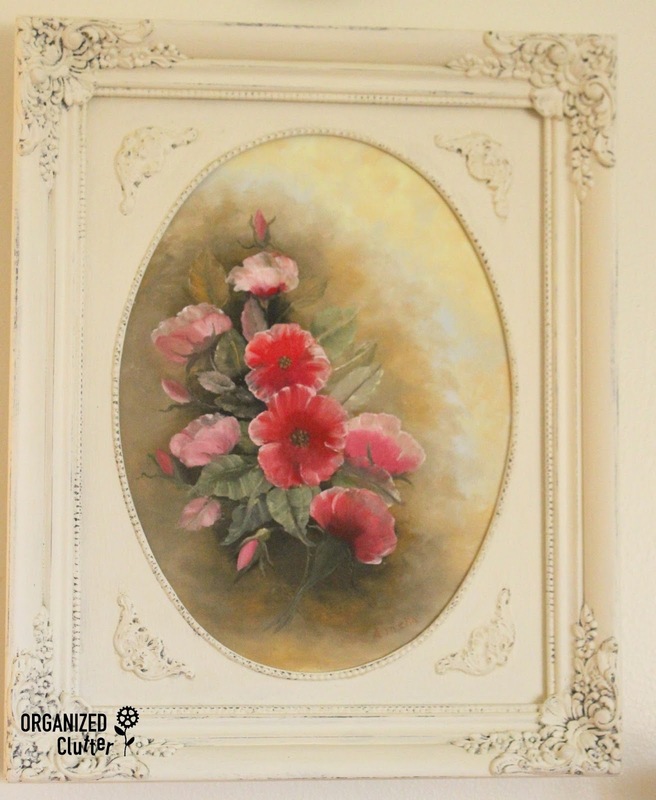 So, one of my friend's helped me add another ornate, vintage white frame to the outside of the garish frame. This toned it down some, but I still wanted to paint it. So when I finally decided to lose the gold all together and paint the frame, I used Walnut Noyer acrylic paint and then ASCP in Old White. I was careful not to get the chalk paint into all of the grooves! 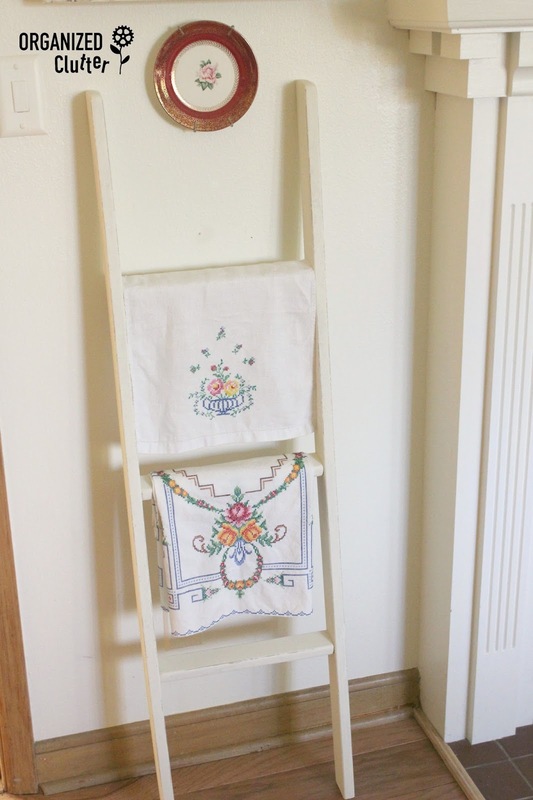 I also got rid of the big "C" and opted for a bunk bed ladder purchased at a garage sale painted in Old White. The bunk bed ladder was actually in the old 1950's blonde wood stain color. It's a perfect size for displaying linens. So here is the whole new mantel/fireplace area. The pedestal drawer plant stand is one of my favorite repurposes and the project details can be found in my blog's right side bar. I love this new look. Still vintage, but lighter and brighter! I love the new look frames for the flower picture. It really helps to soften the look and brings out the lovely painting. Happy Birthday for last week! That I love - the mirror frame is a wonderful unique piece and I love it in the natural wood. Covering up that brass on that other frame was a neat trick- looks great. Years ago my grandma had a mirror similar to this and it was covered in paint. She showed me how to refinish it. 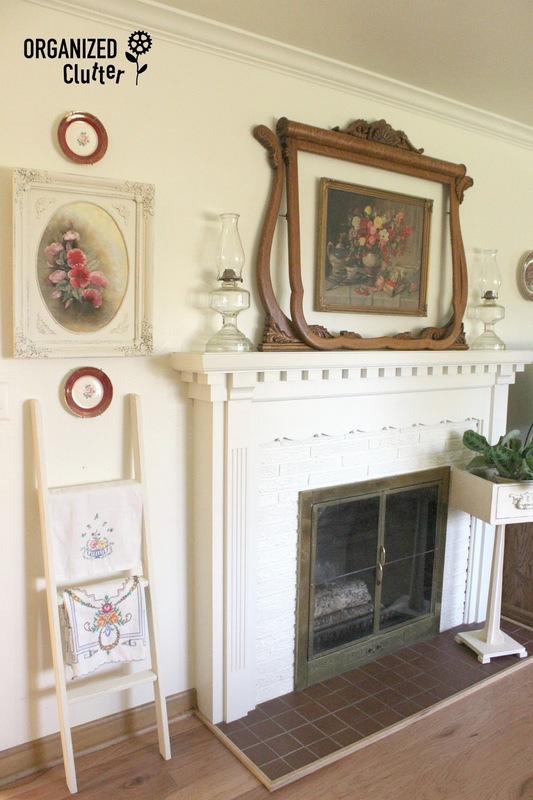 It had the original mirror in great condition and it went to a dresser that she had already refinished. When the mirror was complete and we put it all together it was beautiful. Vintage is my favorite... it tells a story of its own. Great birthday treat! Wonderful idea! Great way to keep an old piece like that in play! So glad you shared it. You deserve to treat yourself for your birthday. I love everything you did! Love the new look Carlene. 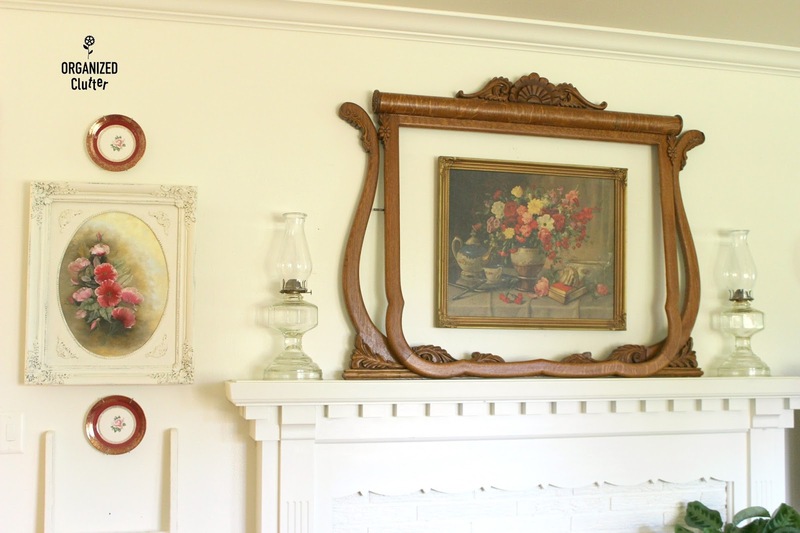 The painting is much better in the painted frame and love the dresser mirror salvage piece. Would love to find one like that. Thanks for the inspiration. 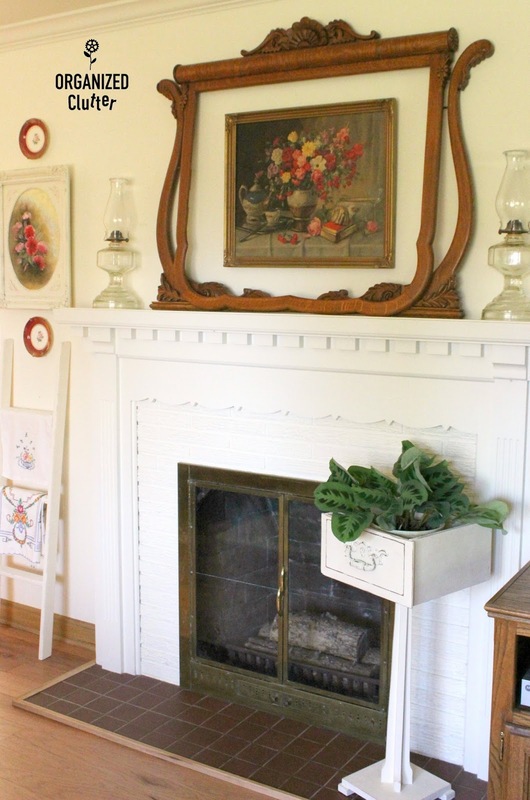 Oh Carlene - the dresser mirror salvage piece is just beautiful. I love how you've used it. The ladder looks great also. Belated Happy Birthday to you. I love the changes you made.....the dresser mirror piece is perfect over your fireplace! Hope your birthday was full of happiness!